With ships and planes, the US and Japan are looking for six missing soldiers. As for the cause of the accident, Its still just some guesswork. After the collision of two US military aircraft off the coast of Japan, six soldiers are missing. A crew member has been rescued from the sea and is being investigated, the US Army said on Thursday. The search and rescue operation for the six other soldiers is still in progress. According to the US Department of Defense, an F-18 fighter jet collided with a KC-130 Hercules tanker as the fighter jet was refueled. The two aircraft were launched from the base in Iwakuni, southern Japan, and had completed regular training flights when it came to Thursday at 2:00 clock night (local time) about 200 kilometers off the coast to the accident. According to a spokesman for the Japanese Army, five crew members aboard the KC-130 and two on board the F-18 fighter jet. Japan participated with four aircraft and three ships in search of the missing US soldiers. The cause of the accident is still unclear. 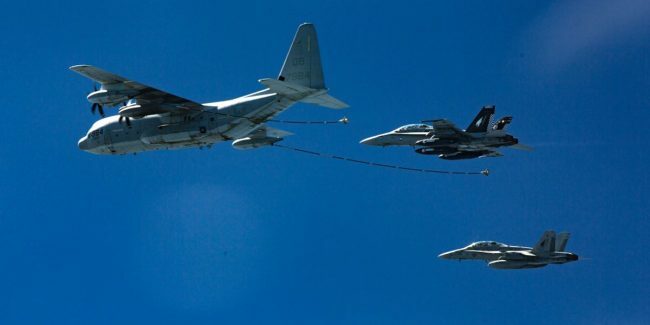 The announcement of the Marine Corps at Camp Butler in Okinawa, Japan, left open whether the two aircraft might collide in a refueling operation. “The circumstances of the accident are currently under investigation,” They said. In Japan, about 50,000 US soldiers are stationed.